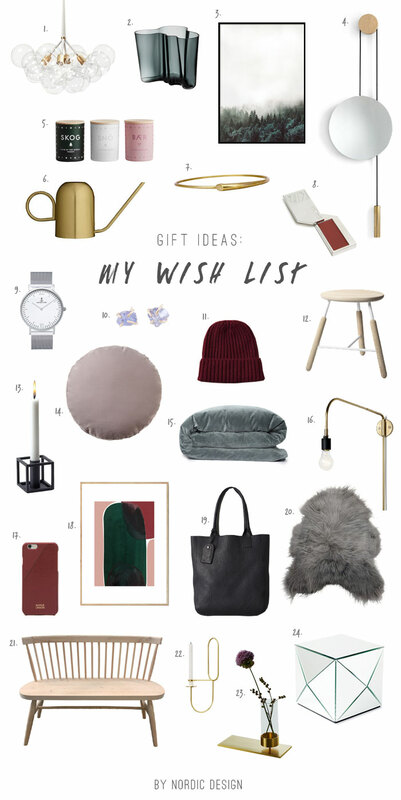 Year after year, I like to compile a list of design pieces, home accessories and other lovely goodies that I covet, and share it with you as my “Christmas wish list”. I have to admit it is rather difficult to limit the number of items because I come across so many beautiful products in my line of work… it’s hard to not be tempted! While I might like and wish for many things, I am actually not an avid consumer. I’ve had a look at my 2014 and 2015 lists, and I can barely check things off it. It is making it extra difficult to not repeat the same products each year, as I want to bring some novelties to keep things interesting, fresh and actual for you guys – Because you know, I still long for Lyngby vases, this print by Details by M., this rug by Saana ja Olli , the Tribeca Harrison chandelier from Menu, etc. I guess the timelessness of Scandinavian design doesn’t help with fixing this dilemma. But I think it’s nice to play the game “If I could pick anything from a store right now, it would be…” and, just like every year, boy did I have fun! I’ve created four articles which I’ll share in the upcoming weeks: Gift ideas from my wish list, for him, for her and for kids, for any budget. I hope you’ll enjoy them! Let’s start off the series with my own top picks. Do you see anything you like? Looking for more ideas? Check out last year’s list. Visit my Christmas section for more inspiration.